As immigration-reform legislation begins to take shape, immigrant-rights activists insist that any legislation that divides their communities will not work. “How can anyone take the Democrats or the Republicans seriously if they continue to break apart our families?” asked Jose Vera, an organizer with Southwest Suburban Immigration Project in Illinois. As immigration reform legislation begins to take shape, immigrant rights activists continue to insist that any legislation that divides their communities will not work. If Washington wants to address the very real challenges of immigration in the United States, people like Vera believe that it needs to start listening to undocumented people themselves. To him, for instance, a good place to start for fair and just reform would be to stop all deportations and create a single pathway to citizenship for all 11 million undocumented people living in the country. Missing from Washington’s proposed plans is serious consideration of the root causes of modern migration, including free trade agreements such as NAFTA that have crippled local economies and fueled the demand for cheap immigrant labor. 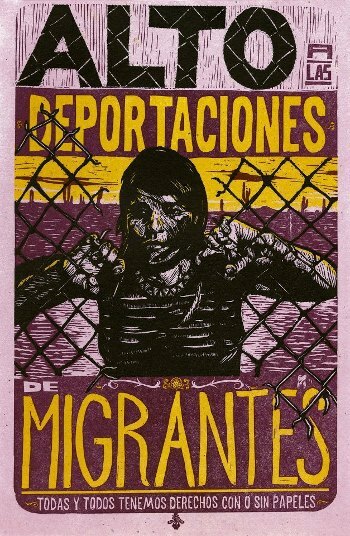 Further complicating reform efforts, too, is the rise of an immigration-industrial complex — led by the for-profit prison industry — that has reaped tremendous profits from the criminalization and deportation of undocumented migrants. In the eyes of immigrant activists, the immigration plan recently leaked from the Obama White House falls short of even the 1986 Immigration Control and Reform Act, signed by Ronald Reagan, which granted amnesty to more than three million undocumented immigrants. Unlike the current proposals under discussion, Regan’s plan did not create separate provisions for groups like workers or students. While some argue that the administration’s leak is merely a decoy to bolster the bipartisan Senate committee known as the “Gang of Eight” tasked with creating a framework for reform, both the White House and Congress are finding their plans to be a tough sell to immigrant rights organizations and undocumented communities. “You can’t talk about legalizing people if you are talking about deporting them at the same time,” said Jacinta Gonzalez from the New Orleans Workers’ Center for Racial Justice. More than 400,000 people were deported in 2012, more than any year in U.S. history. The current policies require Immigration and Customs Enforcement to meet monthly deportation quotas. Calling for a moratorium on deportations as a constitutive element of immigration reform, more than 250 domestic workers from the United Workers Congress met in Washington, D.C., during the State of the Union address to demand more labor protections and the right to organize for immigration reform. The United Workers Congress, representing throngs of workers who are excluded from the right to organize, has released guiding principles for what an inclusive roadmap to citizenship might look like. Gonzalez, one of the organizers of the United Worker Congress event, said that the purpose of the gathering was to bring together low-income workers to lift up the voices of those directly affected by the current polices of deportation and enforcement. Of particular concern is the targeting of leaders involved in organizing for labor and civil rights such as the “Southern 32,” a group of immigrant organizers in Southern states who were arrested and face deportation as a result of their activism. On February 14, activists disrupted a Senate Judiciary Committee hearing on immigration chaired by Sen. Patrick Leahy to protest the massive volume of deportations that continue amidst the Obama-led immigration reform process. The action coincided with Department of Homeland Security Secretary Janet Napolitano’s comments and resulted in 14 arrests — including arrests of undocumented persons. Letty Ramirez, from Puente Arizona in Phoenix, chose to act because of how federal deportation policies are tearing apart families. Voces de la Frontera — a grassroots immigrant rights group in Wisconsin — is holding town hall meetings in immigrant communities as it prepares to kick off a “Keeping Families Together” national bus tour. In conjunction with Fair Immigration Reform Movement, Voces and other allies will be touring the nation to build support in the lead-up for a mass national march on April 10 in Washington, D.C.
Last June, President Obama created the Deferred Action for Childhood Arrivals program to halt the deportations of young people who would qualify for citizenship if the DREAM Act passes. The program, however, does not confer citizenship; it is a two-year waiver from deportation proceedings. It also covers only a small percentage of the undocumented population. The Immigrant Youth Justice League, a Chicago-based activist community, has been collecting responses from undocumented immigrant students, workers and organizers regarding the ongoing debate about immigration reform. Tania Unzueta, an organizer with the league, told Waging Nonviolence that the voices of those living without papers must be prioritized in immigration reform proposals. “Undocumented immigrants are not just stories to illustrate the need for change, but active contributors to the strategy and the discussion on the need for change,” said Unzueta. One of those letters came from Immigrant Youth Justice League co-founder Rigo Padilla, who successfully defeated his own deportation in 2009. In the letter, he takes the struggle for change outside of the halls of Congress and the White House. Alongside the DREAMers who are eligible for the Deferred Action for Childhood Arrivals program, millions of others stand to be left behind. Many undocumented workers — including at least half of the 1.8 million farm workers in the United States, and many others because of past deportations and criminalization — will not end up qualifying according to the proposals currently being discussed. Recognizing this, immigrant rights groups are emphasizing the need for reform that will reach all 11 million undocumented people, not just select groups like students or skilled high-tech workers. The established networks among immigrant communities and immigrant rights activists are poised for dramatic action to make truly comprehensive reform a political reality. In the meantime, the focus on organizing and direct action to stop deportations will continue to expose the ways in which U.S. immigration policy is tearing families apart. Aw, this was a actually nice post. In notion I would like to put in writing like this moreover – taking time and actual effort to make a particularly excellent article?- but what can I say?- I procrastinate alot and by no indicates appear to obtain some thing accomplished.